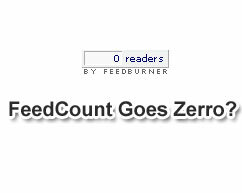 The FeedCount chicklet by feedburner and their main site is showing and displaying zero subscriber count for all registered users since 19th September 2012. According to Feedburner Status Blog, the maintenance team is encountering some serious problems with their stats production pipeline. Due to which the Feedcount has gone zero instead of showing the correct number for current RSS FEED readers and Email subscribers. The problem exists even when you log into your account and check the Feed Stats Dashboard. The dashboard shows zero "0" subscribers with zero reachability. 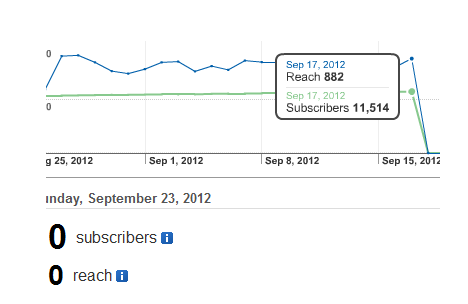 The chart below shows a deep drop in our Feedcount from over 11.5K Readers to Zero, which is surely weird. However the Feed Clicks and Views data function just fine. Issue: We have been encountering difficulties with our stats production pipeline for data representing Sept 19th and 20th, 2012. We are currently working to resolve the issue. The good news is that the developers at Google at least informed us on 21st September about this Bug in count but the bad news is that, around 4 days have passed but still no progress update from them. Issue: We have been encountering difficulties with our stats production pipeline for data representing March 13th and 16th, 2011. We are currently working to resolve the issue. Update (8:00am PST 19-Mar): Stats production issues have been resolved and both of the missing days restored. Well do not panic and do not worry about loosing your hard earned loyal Subscription list. For some reasons such technical errors are obvious for a large database such as Feedburner. It wont take longer than 26th September for the error to be resolved hopefully. In order to avoid leaving a negative impression on new visitors, I would advise that you temporarily remove the FeedCount widget and restore it once the issue is resolved. This will not discourage unique visitors from following you on social networking sites. Visitors today mostly judge a blog's reputation by its readership so its better to remove it than displaying a zero count. Is Feedburner Loosing its credibility? Well such issues could be a little disappointing for people who market their business online and in local seminars and workshops. I had a presentation recently in front of 160 students and it felt pretty wired when they misunderstood our readership as ZERO. I am having another presentation this week on 29th September at Greenwich University on the topic "Make Money Online - From your living Room" and I just hope the problem is resolved soon because it looks unprofessional to give justifications to let people believe that the Zero count is actually a technical error and not a correct measure of blog's readership. But we are still thankful for their free service which has been serving millions of users for the past few years. Though premium FEED services sound much productive but so far we would stick with Feedburner unless we start ebook Selling campaigns. I hope this info may prove helpful for many of our readers who were worried about losing their loyal readers. For those who are still confused you are most welcomed to ask any related question.